I'm so happy for Mandy that I almost cried when I saw it. 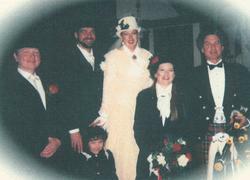 On December 14th, in 1996, I married my beloved. I had done what I swore I would never do again ... move for a woman. My first wife was an uptight Catholic woman, remarkable and talented and a very good friend. We were friends in high school, and continued that friendship since we were among the very few who were willing to go to that "liberal waste" of a college called The University Of Montana. Most of our classmates went to Montana State University, the "real" school of higher ed. I dropped out of UM after one quarter due to family matters (explaination later maybe). But I kept in touch with her (the woman who would become my first wife), and held her dear to my heart. I moved in with her while she was still in school and I was working nights at a retail store. After about nine months, she left me for a balding short cowboy. I was devastated, but learned a great deal about closeness and commitment. I fell into a relationship with a woman who was nothing short of beautiful and loved me very much. I hurt that girl a great deal, (not physically) because my heart was set on another. After about a year, I got back together with the first and asked her to marry me. In 1985, I was married for the first time, in a huge Catholic wedding, with Jon as my best man. The marriage lasted 4 years, before we both figured out that we were better as friends than as a couple. Our expectations were different, our goals were not compatable. My second wife was a rebound chick. I split with the first wife during the worst cold spell that Montana had faced in about 95 years (40 below without the windchill, minus 100 with). It was fun being in that house, I can tell you. I moved out when the cold spell snapped, leaving most of my previous life behind. My second wife was someone I knew I shouldn't be with, but stayed with anyway. During my time with her, I met Chris, and fell in love. While the wife was in a drunken stupor, in a tent down below, I stood with Chris on a hillside and realized that she was all I had ever wanted in a woman, a companion, a friend. But cheating on a loved one is wrong, and evil, for both Chris and myself. I left Chris that night as a friend only. I avoided Chris after that night, and then moved to Missoula after graduation, and had no contact with Christine for many years. My second wife left me in June of 1994. Its hard to believe, now, but I was completely destroyed. All my hopes were crushed ... for about two weeks. After that, I went about the task of putting my life back together again. I made romantic mistakes, acted the fool, did all the things that men are supposed to do. At an event thingy I met a woman who was from Bozeman and might likely know Chris and her sister. Like a puppy I waxed lyrical about my feelings for Chris, and , strangely enough, I received a phone call several weeks later from my future/current sister-in-law. The woman I had talked to turned out to be a roommate of Chris and Mandy (my sister-in-law), and had told them what I had said. Chris was too nervous to call, but Mandy is my brave-twin-of-a-different-mother. The group of them were coming to the Missoula area on vacation, and wanted to get together. Though more could be said, I won't, and the rest is history. I moved to Bozeman in December of 1995, and married Chris in December of 1996. I have not regreted one instance, one moment, one second of the time I can spend my life with her. I love her dearly, and she is my wife, my soulmate and my very bestest friend. I now proclaim to the world, I love you dearly, Chris, Happy anniversary, and I hope for so many more to come.